Wondering about Arctic wildlife tours or interested in visiting Baffin Island? It’s definitely worth a trip with so many things to do in the Arctic and it’s more accessible than you’d imagine. One of the best places to see Arctic wildlife is Lancaster Sound. It is a primary channel for migrating whales and, an ideal location to spot polar bears. This channel, at the north end of Baffin Island, forms the eastern entrance to the Northwest Passage and is one of the most active wildlife locations in the Arctic. With Arctic Kingdom’s combination of commercial and private flights it is easier than ever to travel to this remote location in the Arctic. If you want to see whales in the Arctic, this is the place for you. 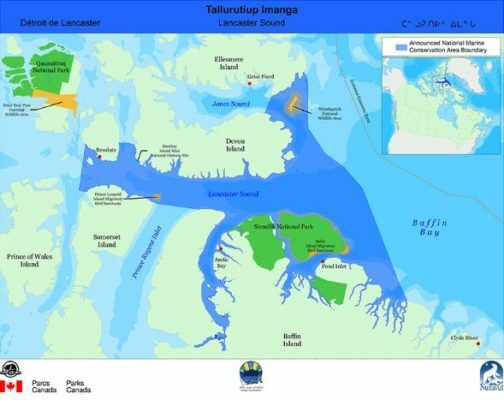 Lancaster Sound (Tallurutiup Tariunga) is one of the main channels that whales use as they travel from the deep waters of their winter territories to the bays, fiords and sometimes shallower inlets where they spend summers. 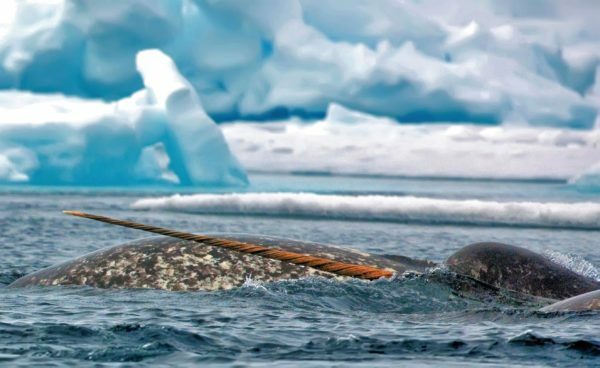 What’s unique about the narwhal, beluga, and bowhead whales, is that they do not have dorsal fins. By not having this fin on their backs it allows them to swim easily under the ice for feeding and easier for them to access smaller breaks in the ice for breathing. This means there are chances to see these whales up close. Early in the spring different species of whales have been known to migrate together. With the sheer volume of whales migrating through Lancaster Sound people have been known to see hundreds of whales at a time. A very active floe edge emerges around Lancaster Sound. The floe edge is where open water meets land-fast ice. This break in the ice means that sunlight reaches the water and energizes micro-organisms, which in turn brings fish like Arctic cod and Arctic char. 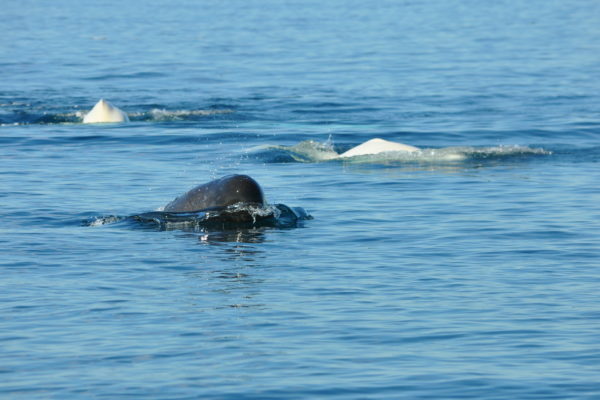 The fish then bring marine mammals like whales and seals right up to the floe edge, making it like a picnic table for the wildlife and a remarkable location for anyone waiting with a camera! Located in the northeastern region of Nunavut, including Lancaster Sound, is a natural seascape that is one of the most significant ecological areas in the world. This proposed marine conservation area recently had its boundaries announced and will be the largest protected area in Canada, with an area of 131,000 square kilometers (twice the size of Nova Scotia). This future conservation area includes more than just the bio-diverse waters of Lancaster Sound but also two migratory bird sanctuaries, a national wildlife area, and a national park. 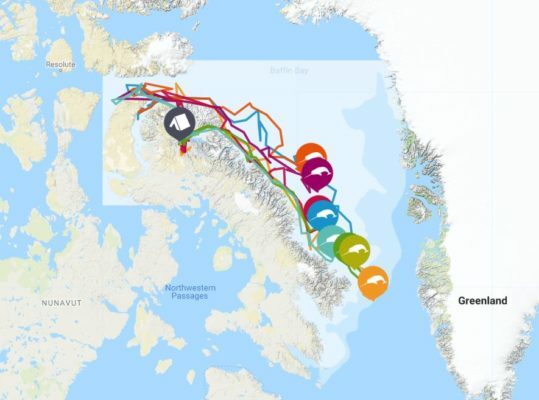 What this demonstrates is just what an exciting and diverse wildlife hub this area is and considering it is easier than ever to visit Baffin Island, it is a real bucket list destination for anyone interested in traveling to the Arctic. It’s easy and comfortable to get to the Arctic these days! With commercial flights from Ottawa to Iqaluit and then to Pond Inlet you could get there tomorrow. Pond Inlet, the community that best offers access to Lancaster Sound, is also considered one of Canada’s “Jewels of the North” with stunning views of mountains and glaciers. Iqaluit offers quick flights to most of the Arctic communities that provide views of spectacular Arctic landscapes and access to the diverse wildlife. It’s amazing how accessible the Arctic is and it is certainly worth it. 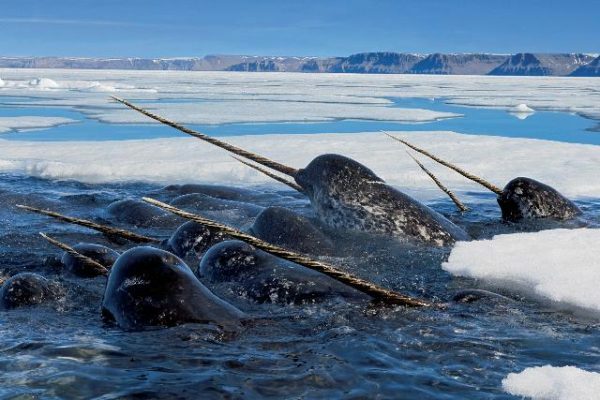 Throughout the entire spring you can find migrating narwhal, beluga, and bowhead whales. In the early spring, narrow cracks in the ice mean you may get up-close encounters with these pods as they navigate their way or come up for air. Later in spring you may find these pods of whales offer longer viewing and photography opportunities as they linger or socialize. With more open water these whales feel less of a rush and can gather in enormous groups. 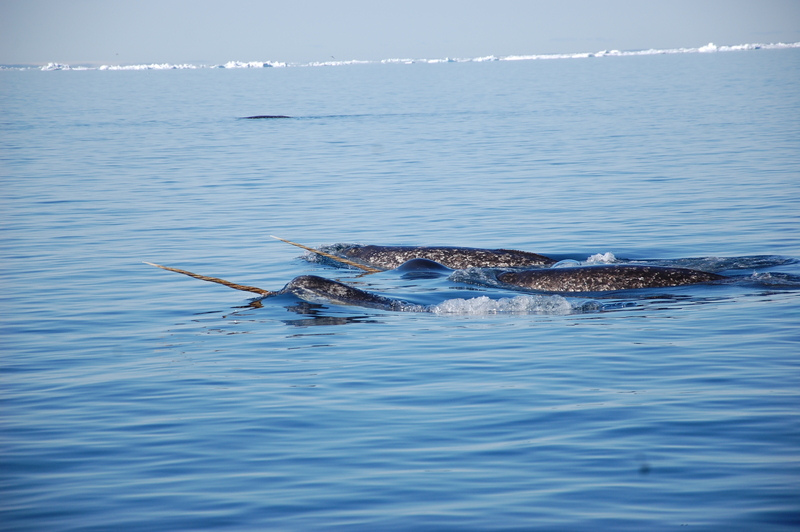 With 75% of the world’s narwhal population migrating through Lancaster Sound there is no better place to find them. About 6500 bowhead whales swim through Lancaster Sound and 1/3 of North America’s beluga whales transit through the region to reach their summer grounds. But not everyone is migrating through Lancaster Sound, some are summertime residents. Ringed and bearded seals are found spending their summer within Lancaster Sound and on its shorelines. Interested in walrus? 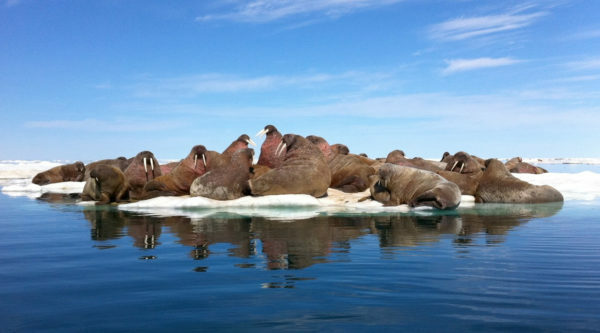 There are nine haul-out sites, beaches where walrus gather, within Lancaster Sound. You can find them gathering by the thousands during the summer. Since polar bears don’t hibernate you can find them roaming their domain all year around, whether over frozen landscapes in winter or swimming among icebergs in summer. But spring is when polar bears will do most of their hunting for the year because they begin to gain access to the open water and mother and cubs have emerged from their dens. This means spectacular opportunities of seeing polar bears when they are most active. Mothers are gaining back their weigh after feeding cubs through the winter and males gain reliable access to seals that no longer hide under the ice. 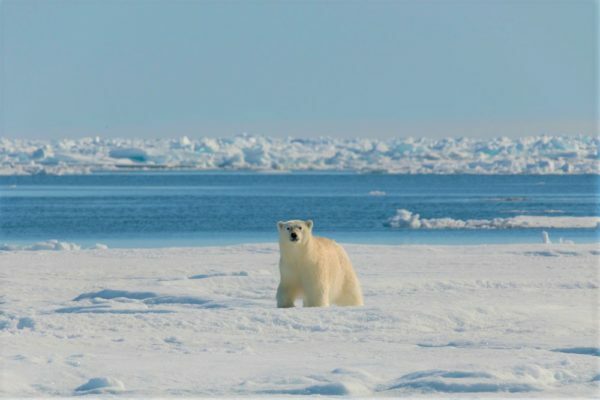 Lancaster Sound alone boasts the second most dense polar bear population in the world so it’s worth a trip!